Automatic mass comparators series AKM-4/X are instruments designed to automatic determination of mass deviations in weights with operator's activities limited to the minimum. 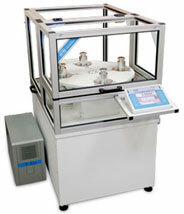 The comparators enable determination of deviations for three tested weights in a single cycle. AKM-4/X are designed to compare weights: 10 kg, 5 kg, 2 kg, and 1 kg. The instruments are commonly applicable in mass measuring laboratories and particularly on certification units for weights classes E, F & M.
Automatized process of mass comparison - weights are loaded fully automatically. Simultaneous measurement of up to 3 weights. comparison (mass comparator located in a chamber with constant ambient conditions). It is possible to operate the mass comparator from PC computer level with installed dedicated software. The measurement processes carried out by the mass comparator are recorded by the supervising digital module or a plugged PC computer. The complete control process can be reported from computer level.